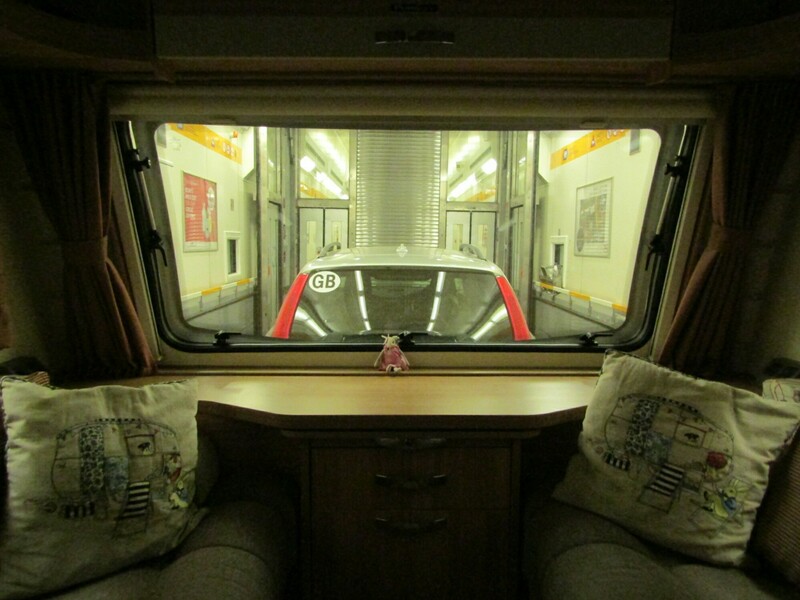 This is our second caravan trip to Europe and on both occasions we have gone via Eurotunnel. We have looked at ferry alternatives but on balance, the cost, frequency of trains, easy boarding, speed of crossing and ability to stay with car/caravan make it a no-brainer for us. Once again we paid for the trip, OK, 50% of it, with our Tesco clubcard reward points. We achieve this purely through use of a Tesco credit card paid off “In Full” every month. The reward points used to be higher and the rewards better but Tesco have realised too many people like us don’t darken their doors or pay interest on their credit. I digress, anyway £50 reward points is tripled to £150 towards our train tickets. Leaving the M20 at J11a you follow the cars (not the Trucks) to the automated check-in booths, the touch screen process is simple because the camera recognises your car registration and just asks you to confirm your booking, including option to switch to earlier crossing, which we accepted. It prints a ticket ‘hanger’ with a large printed letter (we were ‘P’) that is your crossing identifier. You hang this from your rear view mirror, ultimately it gets scanned by an attendant on the train. Now rest, if you have time, the next part looks like a motorway service station but no reversing required. 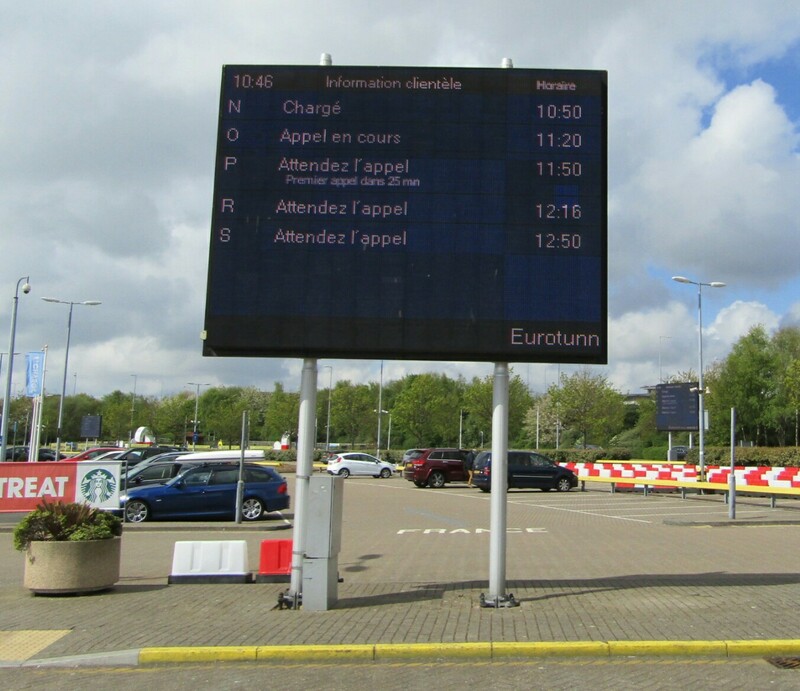 You park up while large boards indicate the status, in English and French, of each ‘Letter’ to proceed or await boarding. The timing is quite accurate so you may have time for a big ‘Full English’ or some last minute travel accessories. Your turn, the board display informs you to proceed for boarding, there is a big ‘To France’ direction sign to help guide you, not that you have any other option at this point. Next is Passport control and security. A small ten minute queue today for us, not sure what kids holidays would be like. Only two lanes open today, a French car to our left tried to jump lanes, the Brits bristled and suddenly glued their bumpers to each other. So funny really, everyone is ending up on the same train anyway plus I realised she was obviously Left Hand Drive and our lane was being served left side. A big hand of authority said ‘Stop’. “Please drive into Lane 2 to be checked” while all the solo cars headed for the train. I had pictures in my mind of rubber gloves in a private room, no, “can you open your Gas locker so we can check the gas tanks are closed”, phew, “have a good day”. Nearly there, one last point where they calculate the length of your outfit and tell you which lane to await final boarding. Then wait for green lights and head for the train. Until the you first board a train you will probably worry about boarding, don’t, the access point is very generous giving plenty of room to get straight for the drive through each carriage. Keep a couple of car lengths back from the vehicle before you and hang back when they slow/stop as you may not fit in same carriage as them, the staff will guide you. Then stop, handbrake on, engine off, select 1st gear, windows half way down, relax. We got in the caravan and cracked open the butties and pies whilst enjoying the journey in comfort, admittedly, it was rocking a bit. No sooner had we finished the butties and sunlight of the French variety was flooding into the carriage. 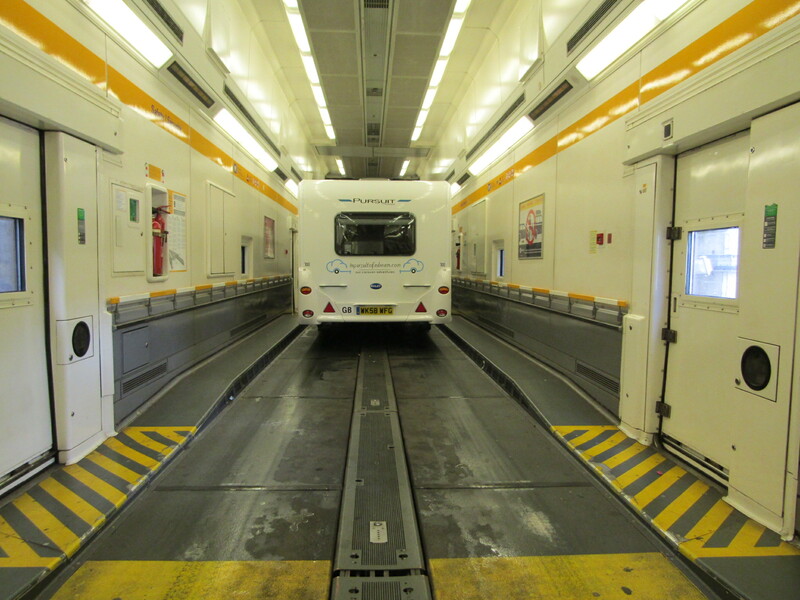 Departing is easier than boarding, you drive out the front end of the train and without being stopped again are filtered directly to the French motorway routes. If it’s your first time ‘on the right’ you will be anxious but signage is good and junction entries/exits extend better than UK ones so you have more time to merge, within minutes you will wonder why you worried. You may find our previous blogs: Towing in France and Low Emission zones and Road Tolls may be useful too. We will probably make use of a surface sea crossing one day in the future, maybe for Spain, but for now Eurotunnel gets our vote. Thanks Michael, some Steam lines over here you haven’t seen yet. Is it ok to be in a caravan? And how long was the border crossing? Hi Ilse, not sure, we felt like naughty children sitting in our van eating. Two staff passed and saw us with no concerns. Forgot to say, the actual crossing is approx 30 minutes. I enjoy your blog so much, every time, even though I am a moho-er, but we all share the same passion, don’t we! Absolutely, sure a ‘Moho’ will feature in our lives at some point. Sorry, forgot to say: enjoy la Douce France! Makes it sound a doddle! Thanks for sharing. To date, we have done 5 trips via tunnel (2 with caravan) and never had a bad experience, no doubt there will bad days but same can be said for any sea crossing. In France before you’ve had time to blink. We don’t have a dog but the dog area at the terminal looked really good. We really like using the tunnel in our campervan. We prep a flask of tea and some sandwiches beforehand then my wife has a snooze on the bed while I change from my UK wallet to my EU one and change all the clocks in the van. We too use the points from our Tesco credit card. 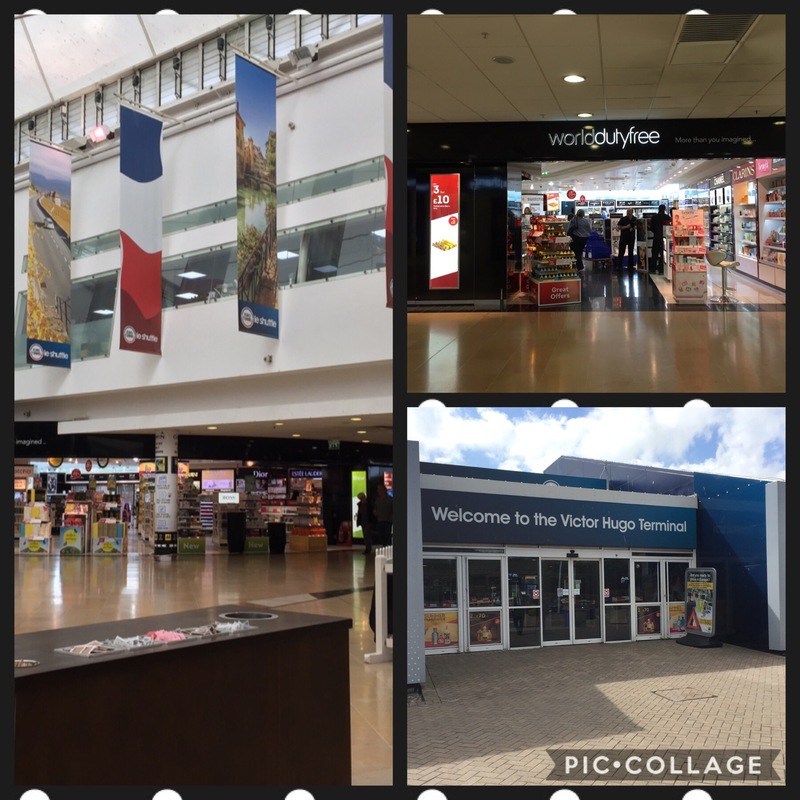 If you don’t fancy travelling under the sea, it’s also worth knowing that DFDS now allow use of Tesco travel points on their ferries to/from Dover, at least for motorhomes (not sure about caravans). 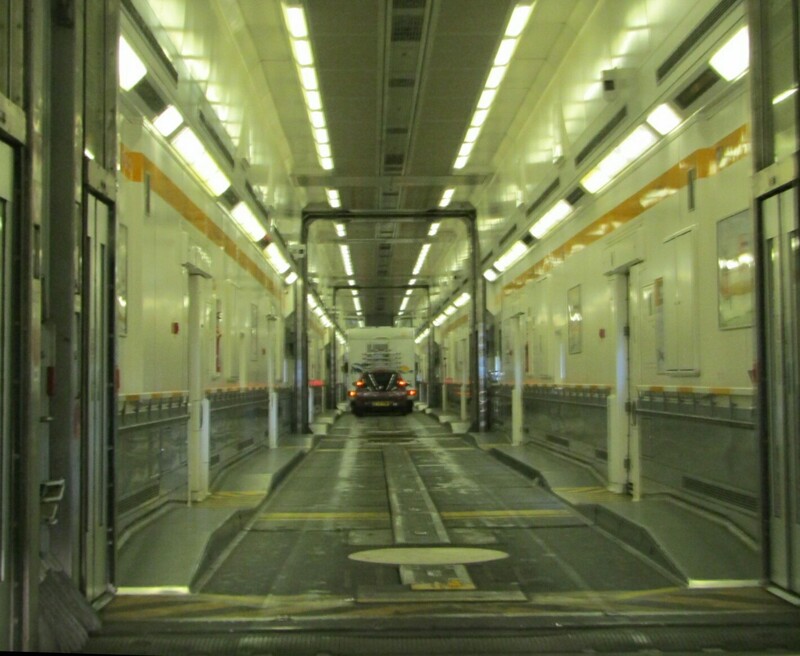 That gives us so much confidence for using the euro tunnel! Thank you very much. Just left that area on Saturday. Delft to be precise. (Delftse Hout caravan site). Being from “up north we use the Hull to Rotterdam overnight ferry for trips to that side of Europe. Have used the tunnel many times when going to Provence etc. OH always says it’s like we never left UK… i.e. Not being on the water crossing. Enjoy Holland… pity you missed Kings Day. Hi George, the never left UK comment isn’t as daft at it sounds, we feel that too – We did arrive one day before King’s Day, free drinks at the caravan park (Wulpen) so we joined them for the afternoon. Sounds like a have to try this. Great post and a very nice site!